On this day in 1989…..
Margaret Mary Ray, who was best known as David Letterman’s stalker, was arrested on February 24, 1989 after being found inside David Letterman’s home and claiming to be the comedian’s wife. This was not the first time Margaret Ray got in trouble because of her obsession with the late night talk show host. 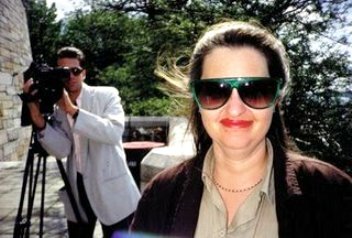 In 1988 Margaret Mary Ray was arrested while driving David Letterman’s Porsche, which she stole from his driveway; her 3-year-old son was in the car at the time. Ray told the cops that she was Letterman’s wife and that the boy was their child. Over the next several years, Margaret Ray was arrested a total of 8 times for trespassing and other charges. She left cookies and an empty whiskey bottle in David Letterman’s home in Connecticut, and books and letters in his driveway. At one point Letterman found Margaret Mary Ray actually sleeping on his private tennis court. Margaret Mary Ray was eventually sent to Niantic State Prison in Connecticut where she served just 10 months for harassing (stalking) David Letterman. After a brief obsession with retired Astronaut Story Musgrave and serving time in Florida in the early nineties, Margaret Mary Ray was released in August 1998. She settled in Hotchkiss, Colorado where she lived on Social Security disability benefits, and worked odd jobs. On October 5, 1998 Margaret Mary Ray knelt on some train tracks in front of an oncoming train and committed suicide. Had it been a GUY stalking a FEMALE celebrity, you would’ve been LAUGHING like a clown upon hearing about his death. I second the “R.I.P.” and have one thing to say to VenomFroggy—I absolutely DO NOT laugh anytime I hear about someone committing suicide, no matter who they are. It makes no difference to me whether the person is male or female, anyone who would LAUGH at someone’s suicide is a despicable kind of person, and may even be a sociopath. It saddens me to hear that something like this ever had to happen. She may have been crazy (she was schizophrenic after all, and that is completely NOT her fault), and she may have made a perfect pest of herself to David Letterman and that astronaut guy, but that doesn’t mean she deserved to die or that her death should amuse us. I look at her sweet smile and I wonder, “wasn’t there anybody in the world who loved this woman or cared for her?” If people were less insensitive and dismissive, maybe she could’ve been given some help. I mean, did no doctor ever see her and think, “Wow, this woman would probably benefit from some anti-psychotics”? I imagine her life was very lonely. I think it is sad when anyone is in that situation, and I certainly don’t think people should be treated as though they are unlovable just because they are unattractive—which by the way, is a matter of personal aesthetics. Someone in the world could’ve found her perfectly beautiful. Everyone in this world should be loved by someone. Maybe if someone had had sympathy for her, or offered her help of some kind, she’d still be alive today. But I assume, as in death, her life was filled with people who called her ugly and crazy, and who treated her like trash. It’s a shameful thing. I’m not saying things would’ve gone differently—maybe she still would’ve done it, and maybe she was unhelpable—but when I see people being so insensitive [to the degree that could regard any one human life as less valuable than another], it really bothers me. You didn’t KNOW this lady, and you don’t know what it was like to be in her shoes. She had a kid, by the way, and that kid lost his mommy that day she decided the world was too much for her to bear anymore. Should we be “laughing like clowns” about that? 53 queries in 0.663 seconds.